Clarizen has upgraded its social collaboration and project management software with improvements to its user interface, charting functionality, discussion forum feature and password administration. "This update is mostly focused on productivity enhancements, driven primarily by customer feedback," said Helena Bachar, Clarizen's product director. Lori Bush Shepard, Clarizen's vice president of corporate marketing, said the company's Clarizen v6 product competes directly against Microsoft's SharePoint, Yammer and Project, but does so with an integrated cloud suite. The charting improvements include new interactive bubble and scatter charts that users can "slice and dice" to visualize the data represented in them. On the user interface front, Clarizen v6 has a refined "resource load" view for managers to scan how a project's tasks are distributed among team members. 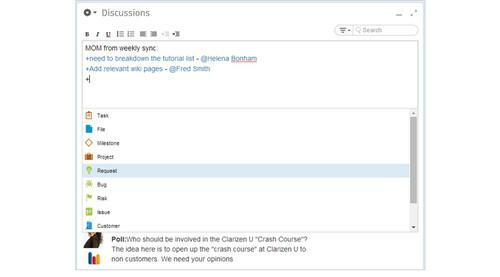 In addition, Clarizen simplified the process for inserting action items to discussion forum posts via a new "hotkey" drop-down menu for creating items like tasks, requests and projects. The password management feature is now more granular, letting administrators establish a maximum number of authentication attempts and the length of user "lock out" times. Clarizen comes in three editions: Professional, which costs US$29.95 per user/month, Enterprise ($44.95 per user/month), and Unlimited ($54.95 per user/month). Those prices are based on a 36-month plan paid fully in advance. However, in each edition customers can buy licenses that are less expensive for users who don't need access to all of the functionality of the full product. The company's about 2,500 clients include Mazda, Marketo, DHL, Sony, Disney, FedEx, Roche and Ricoh. Clarizen, founded six years ago and based in San Mateo, California, recently closed a $35 million funding round led by Goldman Sachs, bringing its total money raised to about $90 million. Other backers include Benchmark Capital, Carmel Ventures, DAG Ventures, Opus Capital and Vintage Investment Partners.